Oil States Industries’ advanced structural-test laboratory is internationally recognized for testing tubing and casing to ISO 13679:2002 <FDIS 2011E>-API 5C5 201 Standards and has been UKAS-accredited since 1992. The Oil States Test Laboratory meets the ISO Standard BS/EN/ISO/IEC 17025 and is designed to simulate normal and extreme operational load cases for product evaluation, prototype development and design validation of FEA analytical models. 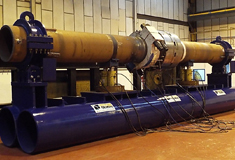 Testing is routinely conducted on structures including: wellhead connectors, valve systems, production tubing and casing, work-over risers, tendon connections and flexible risers. The Oil States Test Laboratory offers complete testing services to oil companies, oil service companies, civil engineering and aviation transportation companies. 8000 ton rig <80MN> tension rig – Primarily used for conducting tension test on TLE tendon connector. tubulars testing – Tension 1000 ton/compression 800 ton. tubulars testing – Tension 2000 ton/compression 1000 ton. tubulars testing – Tension 2400 ton/compression 1600 ton. bend rig – 9,000,000 ft.lbf bending capacity – 7.0″ <178mm> to 36.0″ <914mm>.